The Freedom Tower (now simply referred to as One World Trade Center) is currently under construction in New York; here’s a view of the work in progress compared to an artist’s rendering of the finished product. Am I the only person who finds this troubling? Look at that photo and imagine 25,000 people inside. Such hubris. 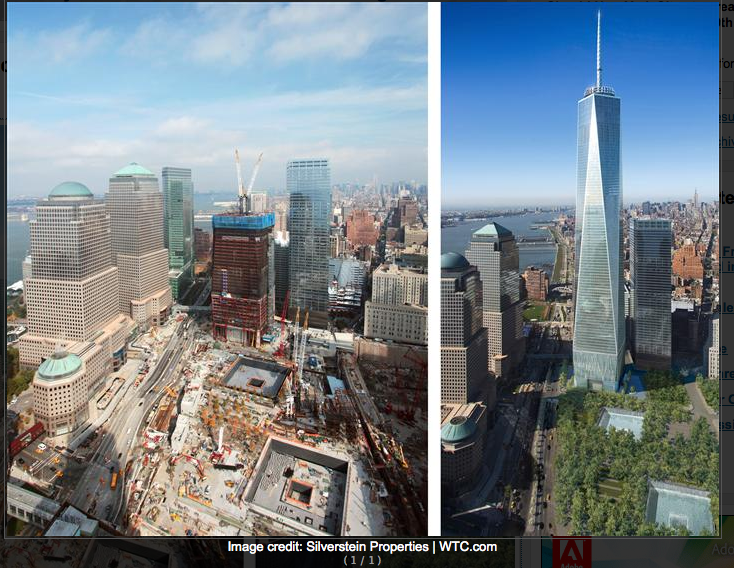 Picture comparative-view « » Latest World Trade Center Images – NYC Freedom Tower. This entry was posted in Culture, New York and tagged 9/11, Freedom Tower, Ground Zero, New York, September 11th on September 11, 2011 by The Anonymous Anthropologist. I’m a native New Yorker. I lived there most of my life. I happened to leave just two months before September 11th and have not lived there since. I remember the first, largely unsuccessful bombing of the Towers in the nineties, and I remember feeling like I was living in a giant bull’s-eye. I remember the controversy when they built the Towers in the seventies, how people questioned their safety — the wisdom of putting 50,000 people in two buildings. I remember the survivor’s guilt that I had on September 12th and the feeling that I should have been there, reeling with everyone else. It’s ten years later and the country has changed. I’ve changed. But I’ve been back a few times and in New York, it’s still September 12th. The flags are still flying, the towers are still gone, and the dead are still mourned. Ground Zero is still . . . zero. Today, they’re on high alert. The ten year anniversary brings new (old) threats. New York will never be the place it was before the attacks, but it’s still the place it was right after them. Time stands still in one place while the clock turns back around it. I’m looking forward to September 13th. This entry was posted in Culture, New York and tagged 9/11, New York, September 11th on September 9, 2011 by The Anonymous Anthropologist.